As I'm getting ready to kick off a new semester and to meet three classes of college freshmen tomorrow, I remind myself what I probably didn't consider when I was in their place: access to a good education is such a privilege. I'm used to reading about girls in other countries deprived of the right to go to school, either because of politics or economics; I forget how many girls and boys, young men and women here in the United States also face obstacles. 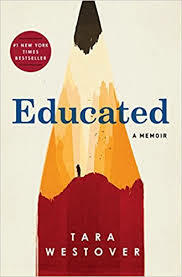 Tara Westover's memoir Educated gives a surprising look at one family's experience. Westover was raised, along with several siblings, in an extreme fundamentalist Mormon family. Her father, whom readers learn as his daughter does, is evidently bipolar, has such extreme anti-government views that he avoids any interaction with the government, always fearing plots to control their lives. The family refuses medical care, neither routine checkups or emergency treatment. Tara's mother trains as a midwife and then builds on her knowledge of herbs, eventually providing the family's financial support. Westover's father spends most of his life in the junk business, resulting in severe burn injuries for Tara's brother and for himself. All the children are pressed into the junk business as well, and Tara has to learn to anticipate her father's moves to avoid death or maiming. The children aren't sent to school, but homeschooling is more of a theory than a reality in their home. Only when Tara's older brother decides he wants to go to college and begins a self-study program to pass entrance exams does she recognize the limits of her own education. Her understanding of math, a big part of the testing, is severely limited. Through hard work, she ends up in college in Salt Lake City, finding that her knowledge of history and current events is even more lacking. Asked to read aloud in class, her professor interprets as sarcasm her unfamiliarity with the word "Holocaust." She is also shocked to find that even among other Mormons, her family's attitudes are extremely conservative. She also has to deal with one brother's physical and emotional abuse and her parents' silence or complicity. 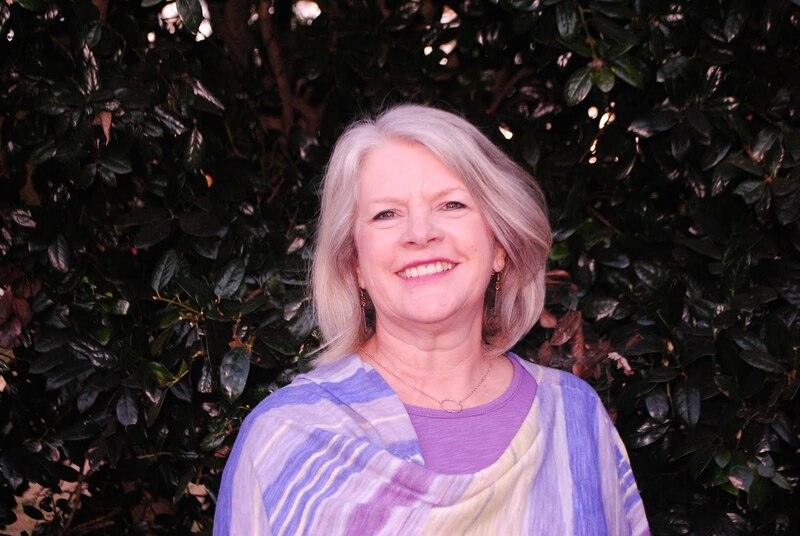 Spoiler alert: the way Westover overcomes her background and goes on to achieve not just a college education, but degrees from Cambridge and even a Ph.D. from Harvard is inspirational, to say the least. Over the course of the book, readers see her growing awareness of the manipulation of truth in which she has been steeped. She sees her family members choose to reject the obvious in order to stay in the family circle. Only through sacrificing her family ties is she able to come to terms with the outside world. When I face my new freshmen this week, I hope to encourage them to ask questions, to test what they are taught as truth. I'll repeat my mantra: The truth will stand up to questioning. Maybe I can even encourage them to be grateful for the education before them. The narrative structure brings to mind books such as The Girl with the Pearl Earring, which traced a Vermeer painting from the most recent owner, back through its numerous owners to the painter himself. 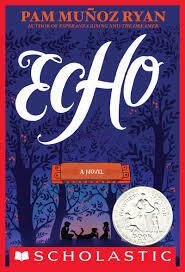 This book, which opens with a fairy tale style of narrative, follows a harmonica from one owner to the next--Frederich, a young boy in Nazi Germany; Mike, trapped in an orphanage with his younger brother; Ivy, the daughter of a migrant worker in California; and Kenneth, a young Japanese-American soldier whose parents are in an internment camp. Each narrative stops at a suspenseful point, with a suggestion of tragedy or disaster; the resolution ties the threads together, explaining the path taken by the harmonica. Much of the story can be considered a historical novel, exploring the way World War II affected people in a variety of situations and setting. One surprise detail was the existence of harmonica orchestras in America during this time period (perhaps rivaled by ukulele bands today). A real bonus of the audio recording of this novel is the inclusion of a number of lovely songs throughout the story. A major theme of the story is the transformative power of music to heal and to unite. Relationships between parents, children, siblings, and neighbors are also explored through the story. Ryan follows the tried and true narrative method: get your characters into trouble and see how they get out of it. The young adolescent characters are realistically naive at times. They jump to conclusions and try to take action themselves, often without considering the consequences. I realize that I read plenty of novels set during World War II, but this one is particularly accessible to younger readers and gives a number of varying viewpoints to these pivotal years in world history. I wish I could remember whom to thank for the recommendation. 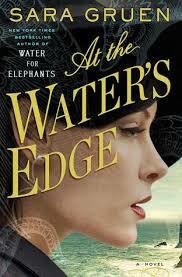 Sara Gruen's novel Water for Elephants was a big enough success to have drawn me to read two more of her books. I'm tempted to give her a rest. Ape House was just silly and improbably (in my not-exactly-humble opinion). I was encouraged to read At the Water's Edge, and the Loch Ness monster angle intrigued me. The problem: I didn't like the characters. After the sad little prologue in which a woman loses a baby and gets (false) news that her husband has been killed in the war, so she pulls a Virginia Woolf, the main characters are introduced--Maddie, a young bride married to Ellis, the son of a wealthy family, but with no money, skills, or job of his own. They are constantly in the company of Ellis' best friend Hank who (spoiler alert) lost Maddie to his friend in a coin toss. Set in 1944, the characters barely register the effect of World War II on others. Shaming the family by their drunken revelry at a high profile party, the two men convince Maddie to come with them to Scotland to disprove charges that Ellis' father pulled a Loch Ness hoax years before. The three take incredible risks traveling in waters where German submarines lurk. Once they arrive at the inn where they lodge, the young men behaving boorishly. Gruen allows poor neglected Maddie to evolve as she sees her husband and his friend through the eyes of the locals they scorn and treat as servants. The plot developments seemed just too contrived for my liking. Even the justice meted out to poor foolish Ellis was far too convenient. At least there were no apes. 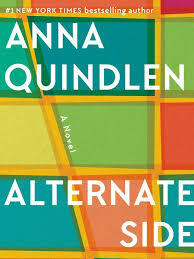 I've enjoyed Anna Quindlen's writing, both fiction and nonfiction, for years. Some of her turns of phrase have found their way into my file of favorite quotes, particularly those related to reading and memories. 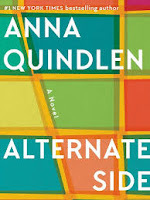 Her latest novel Alternate Side deals on the surface with parking issues most particular to New York City, though an increasing challenge in any growing city. Nora Nolan, the protagonist, loves living in the city, even though her husband Charlie wants her to consider relocating somewhere else. He even takes her to Asheville, NC, as part of his project. They live on a cul-de-sac, where Charlie finally lands a prized parking space in the lot on their block. While Nora lives among the more affluent local New Yorkers, working at a surprisingly successful jewelry museum, a vanity project of the woman who established it with her own collection, she also interacts with the residents of a single residency building; Charity, the housekeeper who helped raise her now grown twins; Ricky, on whom they depend for odd jobs on their street; and even Phil, the panhandler near her work who only pretends to be homeless. When a neighbor attacks Ricky for blocking the parking lot entrance with his work van, sending him to the hospital, neighbors and family members draw lines and take sides. Everything about the neighborhood dynamic is affected. in, to lean across the breakfast table and say, By the way, are you happy? Do you like this life? As I read, I remembered a book I started (and abandoned) recently in which the couple, marking their tenth anniversary together, are told by their primary care physician that with changing longevity expectations, they might have 63 more years together. What was meant to be good news was not received as such. Over the course of this novel, Nora takes a look at the trajectory of her life, considers her options and those any changes will affect. What results is an evenhanded narrative of adult life after the empty nest and a subtle suggestion that one should consider that those around us live much more complicated, layered lives than we can ever observe.